No more "I'm too old" excuses people! Last week I teamed up with my good fiend and fellow trainer Jim Bathurst to help Bob Vastine celebrate his 72nd birthday by lifting 50,000 pounds of weight in 1 hour. He would be doing so with two lifts: the rack pull (a raised deadlift), and the bench press. For only three weeks prior to this event did Jim and I work with Bob to prepare. He had been working with Jim on mobility and some pretty intense stretching, while with me, he worked on light conditioning, stability and some basic strength work. After we went back and forth on some different ideas (last year he pulled the car for his 71st), we decided on this challenge, something that we all thought would be very tough and pretty damn impressive as well. So we got to preparing. It was a rough start. On day one, to see where he stood on the rack pull, we used 185lbs and were only able to make it through 6 rounds before we had to hang it up and get on the mat to stretch out. Bob was mostly struggling with the conditioning aspect of this style of lifting. Holding the world record in his age group for deadlift (450lbs) and bench (285lbs), he really is used to just moving a crazy heavy load no more than a few times and taking a nice long recovery. This was a whole different monster. Jim and I geeked out with the numbers and calculated that he would need to perform 15 sets of a 185 rack pull and a 135 bench press with a 60 second rest between exercises and a 30 second prep time for each as well. This would leave him about 500lbs shy of the goal weight at 60 minutes. So, with training, keeping a close eye on the heart rate the entire time (we didn't want to see that thing get too far over 145, pretty high to sit for an extended period for a 72 year old), we worked to find ways to shave off rest time. We were skeptical on raising the weight because we did not in any way want to compromise his form and risk injury. He looked so good in fact, after 11 rounds Jim and I added 10lbs to each lift for 6 solid more rounds. Great work Bob! You continue to be an inspiration to me and to so many others. This past week I know I was right on the brink of going a little overboard. But it wasn't necessarily from training too much. In fact, I really did not train much more than my body is normally used to, the only question as to my actual training would be how quickly I decided to get into this crossfit programming around a marathon. 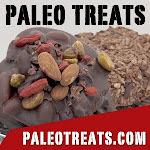 What really played a large role in the way I felt Friday coming into that trans-continental workout, was my nutrition. I was improperly fueled. When I started all this a month ago, I began a modified Zone diet, which was actually going pretty well up until the marathon. I began increasing my carb intake the week before the run knowing that I would need the extra glycogen reserves during the long endurence-filled day. What happened after the run is what threw me off. I completely crashed. And, as a result of the energy depletion I was feeling, and the fact that I had all this left-over food at my place from the marathon event, I ended up consuming not only a bit too much, but also a bit too much of the wrong kinds of food (IE: crap carbs in the form of flour, wraps and chips, refined sugars, sodium filled sandwich meats and nowhere near enough veggies and natural sugars and fats). When improperly fueled, my body ends up reacting in a couple different ways (I know from plenty of experience): my metabolism gets thrown off drastically resulting in abnormal sleeping patterns, fluxuating energy, slight mood swings and feelings of weakness and super strength. When read, this sounds like I all of a sudden became some roided out crazy man running down the street looking for his next kill; while, more realistically, these effects were very subtle and only noticable by me, and maybe a couple really close, very observant friends. Prepare, and don't forget to eat. Upon a short recollection of my last couple weeks, I found that the main theme was my complete lack of schedule for consumption. Even on days when I ate well (meaning, I don't consume crap/fake food) I was still not doing so on a regular schedule. There were times when I would go 4 or more hours without eating more than a few pieces of dried mango, and for someone who's lifestyle demands constant activity, I need to make sure that I am constantly fueling so that I can keep my metabolism running smoothly. The worst part about doing this is that in the evening, when I started to slow down from the busy day and the hard workouts, I would then all of a sudden realize just how damn hungry I actually was. And in the past couple weeks, my attempts to control that hunger were pretty weak to say the least. So, tonight, I had Gladiator playing in the background while I shuffled around the kitchen cooking up chicken breasts, ground ostrich, chicken apple sausage, turkey chili, salmon burgers and few other main proteins. I also wrote out a basic list of meals throughout the day to follow, and general times foe when I should be having those meals. Now, all I will have to do during the day is check my cards, check my watch, add the veggies, salad, fruits, beans and eggs and my meals will be complete. It really was not a very difficult thing to do, it's just one of those things you have to kick yourself in the but and just DO if you know you won't have the time for it during the week. Preparation. A fit, healthy person will always be prepared. Yesterday was the second installment of the Trans-Continental workout with my friend Blair Morrison who's out in Belgium getting his masters. It was a step forward in intensity this one, but it was a great time. The best part about it for me was the fact that we had a few people join in the fun. Blair had to perform the workout a couple days earlier because he was headed off to Switzerland for the weekend, so we were able to have something to push for. His final time was 14:23, pretty damn impressive for such an involved workout. Check out his write-up and video HERE. Five of us gathered in at Balance Gym and got prepared, myself, Ori, Steve, Dan and Reggie were set up for the workout and good ol' Mike was in charge of the times and the camera. Steve, Dan and myself used the prescribed weight (except we did 85lbs on the walk because we don't have 80's...) and Ori and Reggie used 75's and 160 and 135 on the clean and jerk respectively. This one was tough. 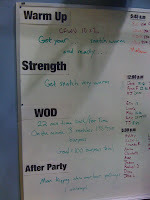 I struggled through the double unders the first round, then found a comfortable rhythm with the clean and jerk. My legs had nothing, so much so that I resorted to a split clean and split jerk after about 15 reps or so. I will be posting up another post this weekend about over training, something I feel I may be teetering with as I am really struggling with recovery. But the workout was a great test of being able to endure a heavy weight with very technical movements, combined with the ability to stay light and agile with the double unders and keep full support of the body through the walks. 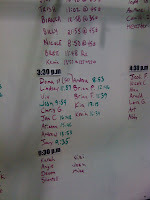 I ended up finishing in 18:35, Reggie in 18:32, Steve in 19:02 and Dan, tore it up with a solid 14:55. Ori struggled with a exertion migraine right off the bat and wisely pulled out of the workout before it got too serious. Later on in the day I took a bunch of my baseball guys through the workout as well, you'll see them mixed in the video. Everyone really pushed with this one and seemed to really enjoy it. I'm really looking forward to the next workout we can share overseas, and hopefully we can get even more people to join in! Video will be posted later today or tomorrow. So yesterday I got all amped up to get back in some heavy lifting. In the morning I got a bunch of sets of dealifts, getting up to a 1RM of 435lbs, waaaay below my PR of 485, but it's been a while since I did it, and I was happy with the workout. My posture broke a bit on the last two sets, but it was never enough to cause any unnecessary tightness; and, today, hamstrings and glutes a little sore, but nothing too bad at all. At night I went back in the gym and did a workout called "Angie" This one is a bodyweight workout of 100 reps each of pull ups, push up, squat and sit ups. I focused on keeping full proper form on everything, especially the sit ups. The pull ups were a breeze, getting 35 straight off the bat, then finishing off the rest in 5 more quick sets. The only issue, my hands got completely torn to pieces. They are in majorly rough shape right now... The push ups were my hardest of the exercises. I was only able to get 10 straight, then just broke them up into quick sets of 5 through the end. I really need to focus a bit more on this exercise, I used to be able to bang out 80+ on a daily basis, now I struggle with 30+. I'll probably start to add more push ups during down time at the gym over the next few months, that is always a great way to build on your total reps. The squats were nothing. I took three breaks during the work and those breaks literally were a step back, a breath and then back into it. The site ups were the most time consuming as I forced myself to keep the butterfly position with my legs (bottoms of feet together, knees splayed out to the sides) forcing my lower half out of the picture for the movement. This made the exercise a little tougher because I wasn't able to use momentum, so I just moved a good deal slower than I am used to with the sit up. When all was said and done, I finished in 16:13, which I was pretty happy with. I really wanted to to break 15, and I think that that is totally possible for the next time I attempt it. Today, I have strict overhead press work, then doing a tabata row and squat routine with Ori. Getting very excited to the second Trans-Continental workout with Blair this coming Friday. He'll actually be doing the workout tonight because he'll be traveling all day Friday, but it'll still be cool to have both our views from different countries. To add to the excitement, I have recruited some 7-9 more people to join the workout. Should be a blast!! What a damn good weekend of work this was. 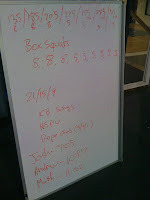 Friday was meant to be a gymnastics day, and I thought it would be fun to try out the 100-burpee challenge (basically, 100 burpees for time). I had a couple buddies agree to play along so we decided to throw a mile run on the end of the workout, then get some good overhead squat work in as well. We really didn't know what to expect from this one, just looking through the internet a bit and finding that some of the best times out there were in the low 5's, so, I guess we just wanted to come somewhat close. It was a quick one, fatigue hit fast, but once it hit, it didn't get any worse. What this means is that I was able to go hard off the blocks, but then around 30 reps or so I started to slow up. Once I started to slow though, I didn't have another change of pace through the end. I just took a couple 2-4 second breathers and kept on trucking. The mile run was a little heavy, but it picked up at the half way point. Overhead squats were great. It took a couple rounds to get back into the swing of things for me, but, I was able to get 135 for 4 very easily on my 6th round, and that was the first time I actually worked those in over six months. etc. until the hill sprints got to 1, and the DB clean and presses got to 10 each arm. In total, I ended up doing 55 of each there and when I stopped my heart rate monitor (something I really like to have for longer workouts because it keep me at intensity) I found that my average heart rate for the 39:02 minute workout was 179! Holy crap! I guess it was the excitement of being outdoors, the amount of people around, the pressure of wanting to get on the road soon, and the bare feet on gravel (the bottom of the hill was gravel) that made me just shut off and go hard. But Saturday night, and all day today, my legs were gone! During the workout I did not feel like I was holding a 179 average heart rate for 40 straight minutes, which, by the way is insane, it just felt like I had done a tough workout. Pretty interesting how mind set plays such a huge roll in how your physical body feels. Finished in 8:58 and I must say, this one was a little rusty thanks to the sore legs from the hill sprints. Finished the row in 3:30 which was pretty good, but the squats got me. I wasn't able to get more than 8 at a time. The pull ups were a breeze. I think that this would be a good one to try to get in around 6 for future reference. Well, an off day tomorrow (I'll probably bike for a bit) and then a great day already planned for Tuesday. I get to heavy deadlift! !